The clouds cleared just in time and people turned out to support the Village of Jameson. They were treated to tacos, refried beans, rice and salsa. A dessert table full of delicious treats and a variety of drinks. It was a beautiful weekend for a Picnic. The Jameson Fire District organized the afternoon activities capping off a week of learning about fire safety. The activities included fire trucks, a police vehicle, the life flight helicopter and Smokey the Bear. They all wanted to have a picture with Smokey the Bear. The kids learned all about what each vehicle did and how it was used to fight fires. They were able to crawl all through the trucks and even try on the heavy fireman’s turnout suit. Later, Smokey helped to teach the kids more about fire prevention and fire safety. The winners of the art contest were given awards certificate’s and everyone received certificate for participating. They all received a bag containing a squeeze ball, pencils and other useful items compliments of the Jameson Fire District Board of Directors. 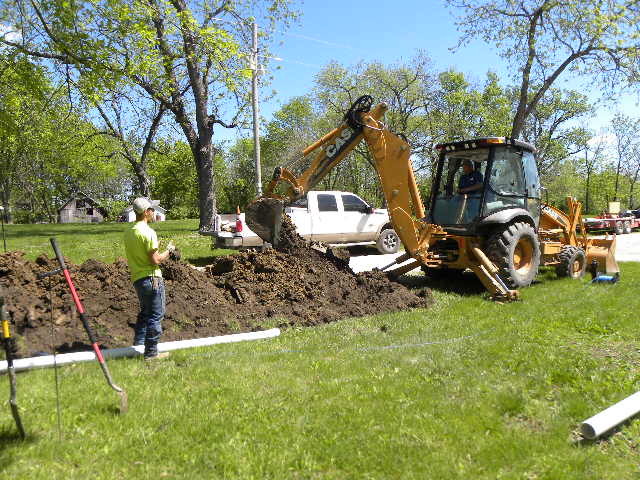 It’s been 7 years in the making but ground has finally been broken for a new water system for Jameson. The old water system was installed in 1965 but by early in the 21st century, it had become susceptible to breaks and leaks. 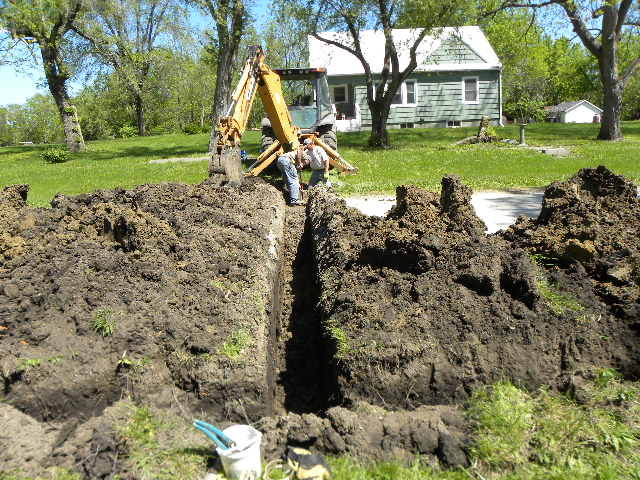 In 2009 the Village Board hired a new Clerk, Denise Caven and the first thing President Art Turley asked Denise to do was to look into funding for a badly-needed new water system. At the direction of the Board, Denise researched the requirements for a new water system and found the first step was to acquire a Preliminary Engineering Report (a blue print) for the project. The Preliminary Engineering Report for the Village water project would cost $12,000.00, more than the Village of Jameson could ever afford. A grant would be needed to pay for the Preliminary Engineering Report. Unfortunately no grants were available for Preliminary Engineering Reports. Finally, she found one grant that funded infrastructure projects, President Obama’s Stimulus Bill. With the help of Jim Cook and Jan Duly, Denise was able to apply for funding for the Preliminary Engineering Report. 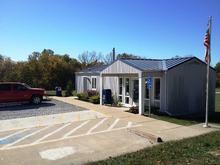 The grant was structured to fund 80% of the cost of the report with the Village funding 20%, or $2400.00. In the grant application Denise requested 100% funding because the Village could not afford to pay the 20%. With letters of support from the Daviess County Commissioners the grant was submitted. Several months later the Board was notified that they would receive 100% funding and the water project was underway. Once the Preliminary Engineering Report was completed, with the guidance of Lance Rains of Green Hills Reginal Planning Commission, a grant from Community Development Block Grants and a grant-loan package from USDA-Rural Development funding for the new water project was secured. 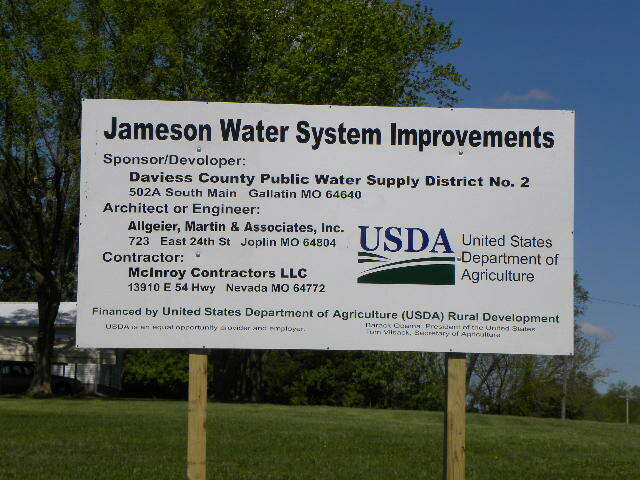 The Village Board wanted to keep the Jameson water system, but funding for the project was contingent on the water system being turned over to Daviess County PWSD #2. Once the funding was in place Board member Beth Wheeler guided the project through negotiations with Daviess County PWSD #2 and completed all the necessary paperwork to finalize the project. Sadly Art Turley didn’t live long enough to see his wish of a new water system for the residents of Jameson come to fruition. However, his widow Aletha is on the Board of Trustees and was able to cast her vote in favor of the new water system. 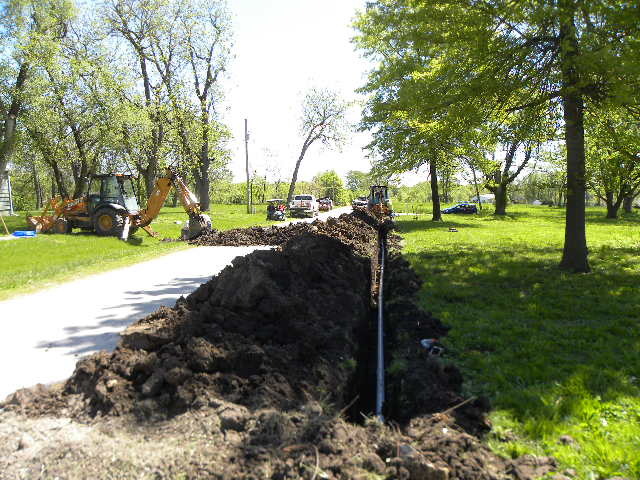 It has taken 7 years, some said it would never happen but due to the determination and resolve of Village Board members, Patty Baker, Natalie May, Aletha Turley, and Beth Wheeler and Village employees, Denise Caven, Jim Cook and Jan Duly, Jameson is finally getting a new water system. The celebration was held in the school gymnasium and was very well attended not only by the whole student body but by many former students. Also in attendance were three past superintendents and several past members of the Board of Directors. Our current Superintendent, Mr. Mayfield, welcomed everyone and then turned the mic over to former student Beth Wheeler ('74) who narrated a PowerPoint demonstration of the history of the school. The children enjoyed learning more about the long history of their school. Afterwards, several past students and staff shared their remembrances. Then the children all assembled outside in front of the school for a photo to commemorate the event for posterity. The photo is a recreation of a photo taken in the exact same spot 100 years before. The children then were allowed to come back to the gym for cup cakes pervided by Amy Weese,Peggy Heldenbrand, and FBLA. Troy Lesan wrote two great articles about the Jameson High School Basketball teams of the past for the Lake Viking News. Click on the SCHOOL tab above to view both articles. Serene country inn in Jameson, Missouri's farm country near the Amish community of Jamesport and historic sites like Adam-Ondi-Ahman...Large new rooms, champagne bubble baths and heated floors. Warm and inviting gathering rooms. Amish table to seat 20. Wonderful full breakfast. Sit on a hanging swing on the wrap around porch. 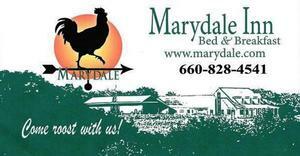 Marydale Inn Bed and Breakfast is a must stay enhanced by the welcoming inn keepers, Dale and Mary-Jo Christensen. The Jameson Fire District, at the monthly Jameson Fire Board meetings, tests the Jameson Emergency Warning Siren.The siren is activated at 7:30 p.m. and runs for approximately 30 seconds. The siren is not tested if there is a potential for stormy weather. Jameson Fire District Board meetings are normally held on the first Monday of the month. However, on occasion, the meeting may be moved to the following Monday. Please check the Calendar for any scheduling changes. Jameson Community Betterment is selling the books as a fund raiser for the community for $10.00 (plus postage) or you can contact Jan Duly at: 660-663-3520 and pick up two or three. copyright © Jameson Community Betterment Assoc. All rights reserved.